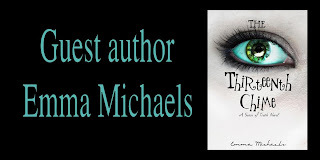 Please welcome today's guest author Emma Michaels. 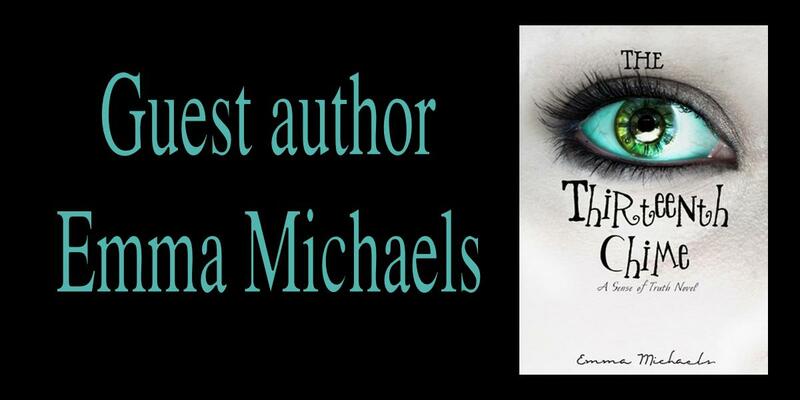 Emma is the author of The Thirteenth Chime which releases tomorrow Friday the 13th! Emma: I have been writing for almost as long as I have been reading though it wasn't truly until I started blogging that I started to think more seriously about trying to make it my profession. I love writing and it is my hope that others will come to love my writing too. If so, I hope to be writing novels for others for many years to come. Emma: I have always love paranormal and all types of fantasy YA novels but I didn't originally intend to write in the paranormal genre, it just happened. I began the idea and let the story tell itself, and I am very pleased with the end result. I hope readers will enjoy reading it as much as I enjoyed writing it! Emma: I would like to have the mind power from "Dark City". The ability to be able to change the world around me with a simple thought could be really useful, especially when helping others. Imagine being able to make yourself fly one moment and then being able to take a junk yard full of trash and to 'channel' it into something useful like a building for people who need a home, or completely renovate a town that has just been hit by a tornado or earthquake. Emma: There is no book like it currently on the market. I believe that it will appeal to a large audience who are looking for something new and different, especially for those who wish to get away from the current norms in literature while still getting to read within the currently popular YA genre. Emma: Kristin Kreuk and Tom Welling because the chemistry between them is perfect when compared to Destiny and David. Here's to hoping that the book is popular enough for a movie one day though I am fairly certain they would choose a different cast. Thank you for your interview and support and thank you so much to everyone reading! Together, we can do anything, even achieve my goal of one day making it to the New York Times Best Sellers list. I can't do it without you! 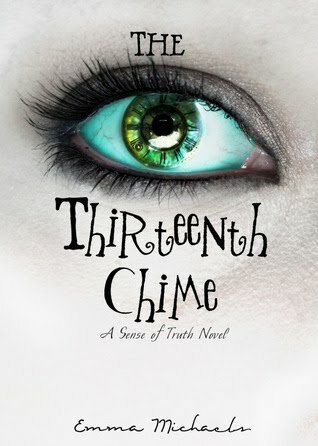 The Thirteenth Chime (Sense of Truth, book 1) by Emma Michaels. No one knew of its existence until it was removed from the attic upstairs. In a beautiful house that overlooks the sea, an antique clock has the power to change the course of their lives. The power the clock resonates will not only force Destiny and ex-boyfriend David on a journey into the depths of one man's mind long dead, but into the mind of a man filled with hatred and bent on revenge. With the only clues to the nature of the clock having disappeared into the sea, Destiny and David must retrace the steps the man had taken into the darkness, before they fall prey to the trap he had set in motion over half a century ago. Hatred never dies. Thank you Emma for joining us here today at From the Shadows! If you would like to learn more about Emma Michaels and her books please visit her website. Great Interview! Thanks, EJ! Thanks, Emma! Can't wait to read The Thirteenth Chime - I'll be doing a quick shout out about the release on my blog tomorrow during Follow Friday/ Blog Hop. Congrats, Emma - your day has come! LOVE this interview :) Thanks for following me and I'm now following you! Thank you so much for the interview! It was so much fun! Feel free to message again anytime! I ordered this book the other day and I am waiting for it to get here! I am really excited it sounds great. Thanks for the interview!